BitWhisk is one of the many Bitcoin mixers floating around in the industry and the Deep/Dark web helping users mix and anonymize their Bitcoins. But, how well does it fair with its competitors and rivals is what we bring forward in this BitWhisk review. Like any other Bitcoin mixer, BitWhisk too operates on the very simple fundamental principal of give-and-take, it takes user-deposits of Bitcoins to its own accounts, and gives them Bitcoins of equivalent amount from its own reserves. Now when such a Mixer isn’t employed, obviously all of the Bitcoin transactions on the globe can be traced back to the tiniest details such as which address sent them, where were they sent, how much fee was incurred during the transaction and so on. However, with such a mixer, because there’s no link between the unclean (initial) coins sent to the mixer and the new ones the mixer sends back to the users, no one can trace or track where the initial Bitcoins went. It’s so because they don’t go anywhere and stay with the mixer untill the mixer sends them to other users, in many different parts, while the user gets to use equivalent amount of Bitcoins without having to use his original set. There however are some advanced measures some mixers offer to further anonymize this process, and based on those features we decide which mixer is better than the other. Keeping the same in mind let’s get on with this BitWhisk review. Minimum Deposit: Extremely low (less than $1 too accepted; differs for each deposit). 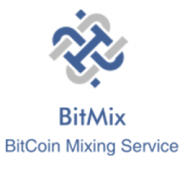 Let’s say you’ve never before used a Bitcoin mixer, would you be able to use BitWhisk with ease? Or how hard will it be for you? That’s how we decide and gauge the effectiveness of any platform’s user-interface. As for BitWhisk, it’s a mixer with 0 graphical elements. The mix-page comprises only of boxes and sliders and nothing else. In my personal opinion it keeps things simple, fast and with lesser distractions. However, it’s more of a personal taste and may vary from person to person. As is evident, the first box is where users are supposed to enter their Bitcoin output addresses, and the “Add address” text is pretty straightforward as well, it lets users add more than one addresses for the BTC output. Then there are the sliders which let you control various aspects of the mix such as time-distribution, time-delays and fee. Although it went ahead and did something unique and exclusive as well; something that’s not so common with other mixers, a calculator! 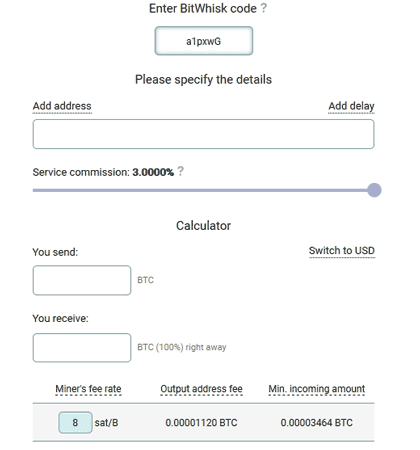 It lets users enter the amount of BTC they’re sending in, and instantly displays the exact amount of BTC they’d receive, and when will they receive on each individual address! 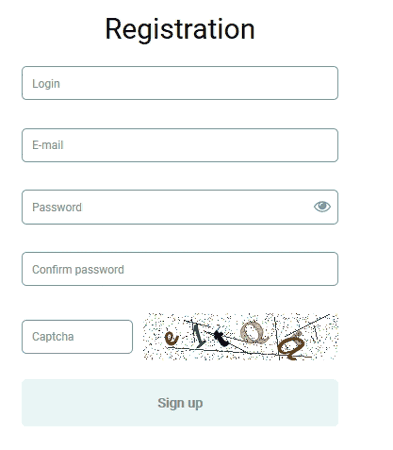 Registration isn’t only an additional step which consumed more time, but also violates user-privacy to some extent hence we aren’t fans of mixers which have a mandatory registration requirement. Fortunately, BitWhisk has no such requirements and lets users simply land on the mix-page, fill up the details and start mixing Bitcoins right away! However, there is an optional Sign up option which provides users with some added benefits such as letting users create a prepare-takeaway key; this is a process by which the mixer pays the miner’s fee and the transaction fee from its own pocket before the user pays the mixer. Registration lets them subtract this fee from user accounts at a later time. 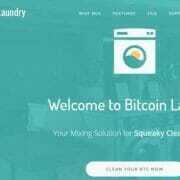 It also lets users invest in BitWhisk investment schemes. As is evident, the registration; if opted for is pretty anonymous and requires minimum data, only an E-mail ID to be exact which can be totally anonymous (infact the platform encourages it). How Many Additional Addresses does BitWhisk Support? 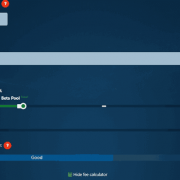 Like most other Bitcoin mixers worth using, BitWhisk too supports Additional Addresses. These are extra addresses users can specify for the withdrawal of their Bitcoins. Using Additional addresses provides for an extra layer of security because then the users’ funds are broken down into parts, and sent to each individual address. Hence, the net worth of coins going in, and the individual outputs coming out for each address are completely different. And secondly because even if someone figures out with certainty any one or more than one of the new output addresses users received the coins on, it’s next to impossible figuring out all the addresses used, and linking them to the set of unclean coins. Does BitWhisk Support Time-Delays? Are they User-Controlled? The first question in the heading is if a time-delay is available, at all! Yes it is. It basically is the feature which provides for a time-delay, or gap between the users sending in their unclean coins; and they receiving the clean coins. The second part of the question is about user-control; which means some mixers do support time-delays but they’re random and can’t be controlled by users manually. While others may provide user-control on the delays, but not for specific addresses. In the latter case, users get to choose only one time-delay, the initial, first gap before which no funds are sent but once this is over the other mixers randomly send funds to the other addresses. 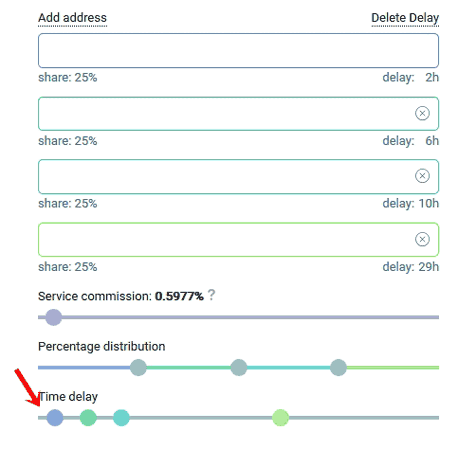 Fortunately, BitWhisk provides ultimate and complete control over the time-delays and they aren’t random, there are sliders which let users control not only the time-delays, but delays for each specific, individual addresses as well. The sliders are colour-coded, each colour-blob represents the delay for the address-box with the same colour as the blob. Does BitWhisk Support Distribution Control? Distribution control is another one of the anonymity features which warrants a mention in this BitWhisk review. When there are additional addresses for a mix, obviously each address will receive a fraction of the total funds to be transferred. The ability to control how much fund each individual address will receive is what Distribution control is. Again, BitWhisk provides maximum control to the users and let’s them control the exact distribution of funds, for each individual address using sliders. The distribution can be controlled to the hour and again the colour-coded blobs and boxes correspond to each other. What are the Minimum and Maximum Deposit limits at BitWhisk? The minimum limit at BitWhisk is specific to each deposit/mix and is displayed during the order process. To be honest, it’s one of the least-demanding mixers I’ve ever seen, I’ve deposited coins as low as 0.00004225 BTC, which was like 27cents in USD value at the time! The maximum limit too however is pretty low and they do not flaunt million-dollar mixes, rather the maximum mixing limit most often is less then 10BTC. This in my personal opinion is the most important question that we could ask or answer in this BitWhisk review. It’s important because if a Bitcoin mixer, whose sole aim is to provide “anonymity” to BTC transactions stores logs, I’m not sure how much anonymity they’re talking about. Fortunately, BitWhisk doesn’t store any logs whatsoever, of any kind except of the “profits” that the platform makes off each mix. As per their F.A.Q no information which can be used to identify the users, or the customizations of their mix is stored. 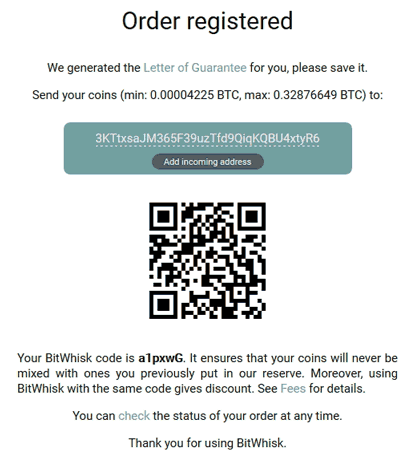 Does BitWhisk Provide Mixing Code and Letter of Guarantee? These two teensy-weensy little features on a mixer make a mixer more reliable and efficient. Yes, BitWhisk does provide a mixing code (BitWhisk code). It’s a code that’s generated for users each time they deposit Bitcoins to the mixer. This provides a kind of link between the coins and the users without revealing the least bit of identity about them. So, the next time the same user deposits Bitcoins, they can specify this code during deposit which would let the platform know which coins were deposited by the same user earlier so that they don’t send the same users coins back to them on the next mix! Letter of Guarantee too is provided on the deposit page, it’s basically a PGP signed message which proves that the deposit address was indeed generated by the platform. Users can always prove their deposit to any address on the Blockchain so the platform can never deny ownership of the address hence can never scam or not pay a legit deposit, without harming their reputation. How much Fee does BitWhisk Charge? 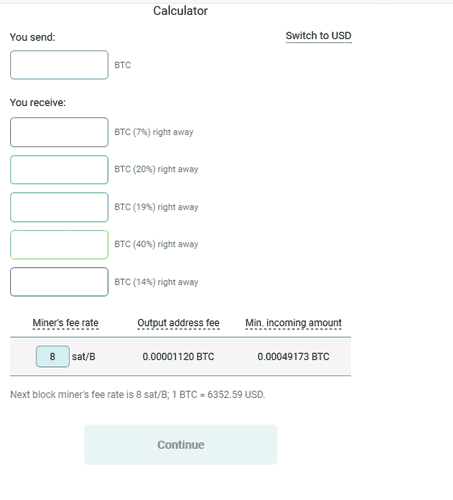 BitWhisk has left no stone unturned when it comes to user control, even though their minimum fee is 0.5% of each transaction, they let users completely control the fee of each mix using sliders. 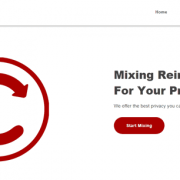 The maximum fee users can opt to pay for a mix is 3% of the mixing amount. Randomizing this fee makes the transaction harder to trace. So that’s me signing off this BitWhisk review folks. I’ve covered all the important aspects/features a Bitcoin mixer is made up of from the UI, time-delays, distribution control, letter of guarantee, to the fee and everything in between. If you believe I left something out, do let me know. Anyway, in my personal opinion, BitWhisk can totally be the first choice for users seeking “user-control”, and trying to mix extremely low amount of funds. There literally is nothing lacking with its features, anything that the best out there offer, it does too. But hey that’s just what I think; do go through the platform and let me know what you think of it as well as of this BitWhisk review.